Easy Rack offer a Pallet Truck with built in Scale that allows you to safely and efficiently weigh your material at point of access. Pallet truck offers a steel frame design and built for strength and durability. Pallet truck is very user friendly and is suitable for low height lifting and short distance moving. Pallet truck has built in scale that allows you to weigh your material as your handling it. Suitable for low height lifting and moving material short distances. 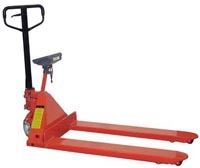 Pallet truck scale is adjusts to the size of your load. Chrome, Galvanized, Zinc and Plated Pallet Jack.